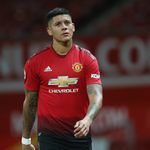 Manchester United have given Marcos Rojo permission to train with Estudiantes, the Argentine club have said. Seems a strange one unless he's agreed to go back in the summer bit short and sharp could just be that he's going to train with them during the international break so he can spend some time at home. He’ll return to training at United at the end of the week reported by the Daily Mail. He needs to go, he’s played twice this season and hasn’t been seen since. I know he’s had injuries but he needs a change of scenery - and with him being 29 we need to cash in now while we can at least get a couple of million for him.